Because we are writing this article this week before official numbers are released, we decided to go inside the numbers and focus on listing inventory and sales data. According to preliminary numbers researched by the Ellis Team, listing inventory rose again for the 3rd consecutive month. Lehigh Acres has been holding fairly steady while Cape Coral is seeing the largest gains in inventory. Fort Myers is inching higher ever so slightly. What’s interesting is the distressed sales market. We track a variety of graphs. 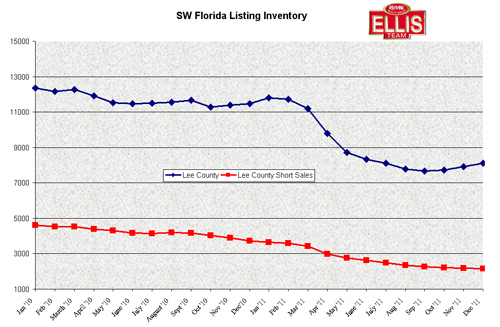 One graph not shown here because it’s a little tangled and hard to read in newspaper format shows large drops in distressed sales in Lehigh Acres, Fort Myers, and Lee County overall. Cape Coral has held steady at 50.45% of all single family sales being distressed. Lee County stands at 48% distressed rate in November. 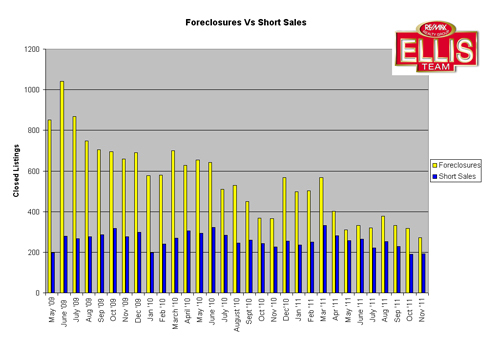 We have included a Foreclosures Vs Short Sales graph that is a bit easier to read. It fairly well shows the history of the foreclosure and short sale market in SW Florida. As you can see, the height of foreclosure sales was in June 2009, while the height of the short sale market was March 2011. Banks revved up their short sale departments to handle an increased load. It can be said that potentially each of these successful short sales may have saved a corresponding amount of foreclosures, so it was in the banks and the markets best interests to sell these homes as short sales rather than as foreclosures. Going into 2012 we’re going to continue to watch the listing inventory and the mix of inventory. Traditional sales are on the rise as a percentage of all sales, although many homeowners are not selling at today’s bargain basement prices. Speaking of bargain prices, many buyers are calling wanting to buy homes for investment and expecting 2009 prices. It seems like sellers are always the last to recognize when prices are dropping and buyers are the last to recognize when prices are rising. Why is that? Could it be selective hearing or denial? We can definitively say that investment homes in Cape Coral and Lehigh acres bottomed in 2009 and have risen since. Buyers today can no longer pick up a home for $35,000 in Lehigh unless it has major problems. $70,000 is more common place for the low end now, so essentially prices in the low end have doubled. Sales are flat in December versus November; however we are expecting sales to pickup in season again. We’ve had no trouble selling homes. The biggest challenges we’ve faced are closing these homes. Lately we’ve been encountering title issues, mortgage re-disclosure issues due to any delays, and buyers not waiting patiently for the short sale approval. We’re getting short sales approved within 60 days in many cases, but buyers are impatient. Going forward the industry will have to do a better job educating buyers as to what the realistic expectations are for approval and closing time frames on short sales. We’ll also watch foreclosure inventory as we are expecting a few more in the 1st and 2nd quarters of 2012. We’ll keep our eye on the SW Florida real estate market for you, and whether you’re a buyer or seller, we hope Santa is better to you this year than he was last year. The market is looking up, and we hope your holiday spirits are too. The Ellis Team doesn’t handle time shares in Florida as they are kind of their own specialty, although there are a few timeshare places at Fort Myers Beach. What we do see more of in SW Florida are rental companies that will assist a homeowner and rent out a condo or home by the week while the owner retains full ownership of all 52 weeks of the year. We have several condo projects and cottages in SW Florida that rent very well by the week. A Buyer can purchase a home or unit and place it in the rental pool and produce very good income while allowing someone else to manage the property and rent out the unit. The owner can even use the property so many days per year per the IRS and still claim it as an investment property. We encourage you to speak with your tax advisor on those regulations as they pertain to you. Unlike a property owner who owns all 52 weeks, a timeshare owner is only concerned with one week. 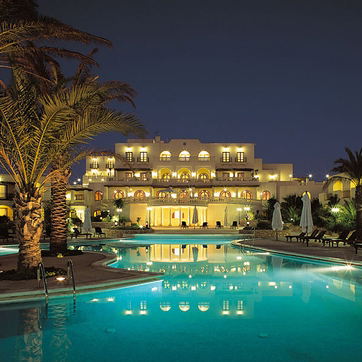 One advantage of a timeshare is its ability to be traded for other like kind properties all over the world. We’ve talked to several people who own a timeshare say in Orlando and love visiting there, but they also enjoy the ability to trade it for weeks in Hawaii, Bahamas, Cayman Islands, Costa Rica, and all over the world. Once you own a timeshare you simply pay the weekly maintenance fee each year and then you’re free to use the unit on your selected week, exchange it for a different week within your association if permitted, rent it out, or join an exchange service like RCI or VRI to exchange it for nice place elsewhere. While you pay a yearly maintenance fee on your timeshare, there can be significant cost savings when exchanging your unit. Perhaps you own a 3 bedroom unit. You may be able to exchange for a week of a 2 bedroom unit and another week’s use of a 1 bedroom unit, or both during the same week. You can even exchange credits on your time share towards use on a cruise. Depending on how nice your unit is, where it is located, and which week you have will determine how much credit you get towards exchange to another timeshare or cruise. Timeshares can be great for those that like to travel. Years ago timeshares were selling upwards of $30,000 in the Orlando area. With the economy being down it seems prices have come down and now you can own them for much less. In fact, we’re aware of an owner of a 3 bedroom unit at Cypress Pointe Resort at Lake Buena Vista in Orlando willing to sell their unit for $2,000 plus closing costs. It is a 3 bedroom unit week 43 rated as Emerald and is close to Disney. It can be exchanged for a 2 bedroom + a 1 bedroom unit or used as a 3 bedroom unit. Cypress Pointe Resort offers lots of amenities for kids. While we do not list or sell timeshares, simply call our office 239-489-4042 if you’re interested and we’ll put you in touch with the owner and you can deal directly. If you’re looking for a condo on Sanibel, Captiva, or Fort Myers Beach and would like info on investing and what it would take to purchase and how much income you could derive from it, we can help. Simply give us a call. Traditionally buyers and sellers tend to think of value for a home in a few ways. Some think of replacement cost, which is the value of the land combined with the cost to rebuild the home including permits, ground preparation, etc. Replacement cost is usually the upper limit of value, and certainly today there are some homes on the market priced far below what it would cost to build. Other methods include comparing what like kind homes are selling for and making adjustments for things such as lot value, location, size, age, desirability of the floor plan, and more. Certain neighborhoods tend to sell for more than other nearby competing neighborhoods perhaps due to amenities, age, upkeep, etc. Of course every home is different, even if it’s the same floor plan. Each home sits on its own lot, has its own view, and has its own set of upgrades. Some homes require some adjustments on the market analysis or appraisal, and some require very few if any adjustments. There is another method used to value homes and it’s called the income approach. Duplexes are often valued this way as is certain commercial property. In tourist areas where a home can be rented out on a regular basis, a home may have a different replacement value than it’s actual value because the home has income potential. Envision a cottage on Ft Myers beach. The cost to rebuild it might be minimal; however it provides excellent income, which in turn might affect its land value. In this case, the highest and best value for the property might very well be its income potential. Sanibel Island limits owners to renting homes out by the month or longer, but Captiva on the other hand allows weekly rentals. This attracts more visitors, both from the US and abroad. It’s no wonder people from all over the world come to SW Florida to spend a week with their family in paradise. 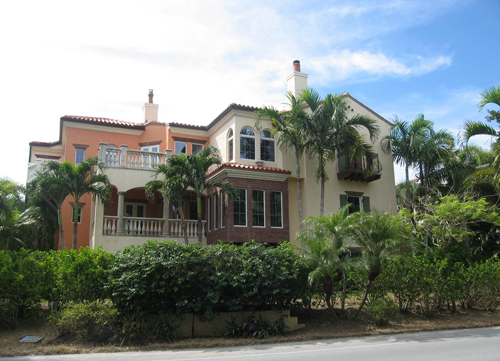 The home pictured here is a home on Captiva and is a rare bank foreclosure. It has a view of the bay and is a 3 story home. 2 of the floors have their own kitchen, living room, and bedrooms, so two families can easily share the home on vacation. Quite often families travel together and look for a place to rent together. This home is priced at $1,651,400 Other similar homes on the market now are priced $2.3 million to $2.995 million. We studied the MLS sheets which showed these homes rental history for 2010 ranged from $120,000 to $150,000. The home shown here features a pool, 6 bedrooms, 6 ½ baths and is walking distance to the beach, bay, shopping, restaurants, and gorgeous sunsets. The previous owner did take most of the fixtures in the home, so new owner is free to pick out and furnish the home to their own tastes. Former owner was a builder and built this home to his exacting standards. If you’re looking for a vacation home with income potential, or strictly an investment property you might eventually retire to on Captiva, Sanibel Island, or Fort Myers Beach, give our office a call. While the home featured here is our listing, we have access to all listed homes and can sit down with you and discuss your needs. Good luck, and happy house hunting.